Stand out above other casino parties by serving food and drinks on Casino Tableware. Start by laying the Casino Plastic Tablecover on all of your tables. Then use our different card suit decorations to accent the tablecover. 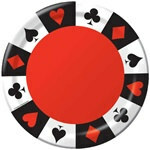 Like the Casino Lunch Plates that have the iconic red and black colors with all four suits around the plate. We also have a Casino Cup and Casino Napkins to match. Along with the tableware, we also have the four Card Suit Snack Trays. These are perfect for your event because they can be set on the table full of snack food and then moved to the game tables so your guests are never hungry. If you want to go with a big bucks theme. We have the perfect decorations for you. The Big Bucks Tablecover will look great with some black and red tableware. Make sure to keep the guests drinks full so that they will place higher bids which could mean a bigger pay out for you! The Upside Down Beet Bottle Glass is perfect for this occasion. We have all the tableware you need to make your school's casino theme prom a success! Choose from our different casino themes to whichever one matches your casino decorations be st. Don't forget to look at our casino decorations and accessories for all your other casino decorations you need! All of the guests will need some food after a long afternoon of getting ready for the big event. Use our Casino Lunch Plates to serve the food on. Along with the Casino Cup and Casino Napkins. Before the guests arrive place a centerpiece in the middle of each table. For example, you could lay a Playing Card Cutout down first and then pick out your favorite Casino centerpiece and place it on top. Like the Casino Cascade Centerpiece, which has the four suit dangling from the center. Accent with some confetti and party beads for a little sparkle. Then use our other Casino and Poker Decorations to decorate the rest of your venue!